Some of you may know Shannon from Coupon Mommy of 3. 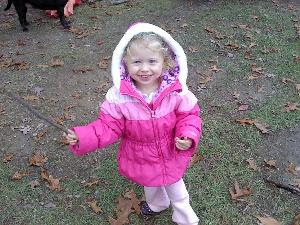 This precious little girl is Shannon's 3 year old daughter Emily, who took ill on December 18, 2010. Symptomatically she looked like she had a bad stomach flu but several tests down the line the family received the shattering news that Emily has Stage IV cancer. Read more about her story, with updates on the Caring Bridge Site Page created just for Emily by Shannon. Please lift up this family in your prayers. We believe the family will also need all the financial support they can get. So to help out, Shannon's friends Karen from Mommy Times and Nancy from Arizona Mama have helped set up this ChipIn account for Emily. The last thing this family should worry about at this time is finances and I honestly believe if all my readers could chip in with a little we can help this family. You can click on the "ChipIn" button below to have your contribution pooled in out of your paypal account. Please, take the time to share this information with others. Repost, e-mail, retweet.... This is a very troubling and heartbreaking time for this family. Their choices should not be made harder based on their ability to pay.